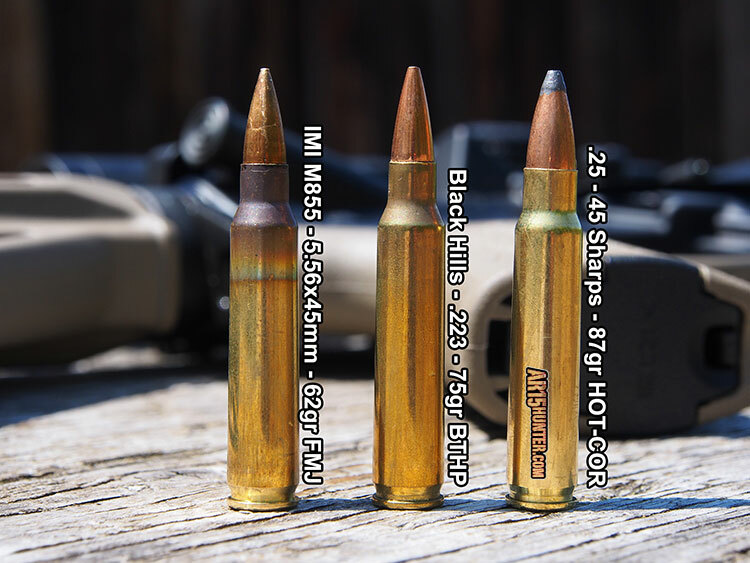 The .25-45 Sharps rifle cartridge is the latest .223 based cartridge to hit the market geared towards hunters going after medium to big game animals with an AR15. Although it was announced a few years ago, the Sharps Rifle Company (SRC) has finally brought this round to fruition. Unlike some of the previous larger caliber hunting cartridges based off the .223 cartridge, the .25-45 Sharps delivers what most hunters need, <300 yard effectiveness on medium to big game animals, with manageable bullet drop. What Sharps has done is take a .223 Remington case, necked it up to .25 caliber and are pushing an 87 grain Speer HOT-COR, soft-point projectile at about 3000fps, out of a 24″ barrel. That equates to about 1700 foot pounds of energy at the muzzle, with the bullet still carrying about 875 fpe at 300 yards. 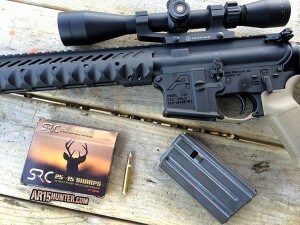 The .25-45 Sharps allows AR15 hunters the ability to utilize their existing rifle, bolt, BCG, magazine, etc, they are most familiar with while out in the field hunting. These same hunters and shooters who practice with their .223 or 5.56 chambered AR15s in the off-season, are now able to change to a more potent hunting round by merely swapping out the barrel to one chambered in .25-45 Sharps (.25-45 Sharps headspace gauges are available from JGS Precision). The factory rounds are designed to feed in standard AR15 magazines and have a recoil comparable to the .223. In our opinion, this round is great for shooting out of an AR15, but one can also rebarrel a bolt-action rifle and add the option to set the bullet out a bit further, or to use a slightly heavier (longer) bullet when reloading. After meeting with the folks from the Sharps Rifle Company at the 2014 SHOT Show, we were eager to test this round out at the range, as well as on some animals. When I received the upper, I mounted it on my Aero Precision lower, which has a Palmetto State Armory lower parts kit, with a Rock River 2-Stage Varmint trigger, and headed to the range. I shot numerous 5-shot groups at 100 yards, with the best coming in at 1.126″ (1.07MOA), with most hovering at 1.5MOA. These were very acceptable groups for factory ammunition, using an upper with a scope mounted at SRC, matched to someone else’s eye relief. My chronograph results averaged 2885fps with a 10-shot string, which is a bit less than advertised, but keep in mind that the 3000fps velocity was from a 24″ barrel (so I was more than happy with the speed). 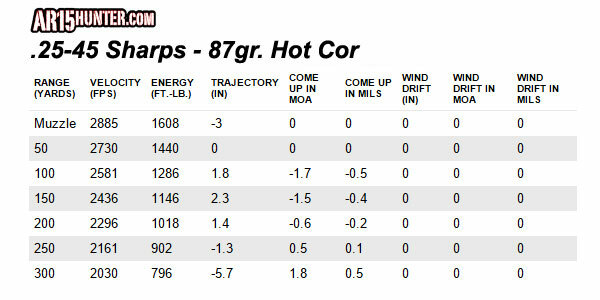 Using our numbers from the 20 inch barrel, and a 50 yard sight-in, this puts the 87 grain bullet only 5.7 inches low at 300 yards, with the bullet energy dropping to 796fpe. Eric had a trip scheduled to Texas to hunt wild hog and javelina, with a little predator calling planned as well. When he received the upper, he mounted it to his main hunting AR15, which is a Remington R-15 chambered in .223. A quick swap with his upper and he was ready to get sighted-in for the trip. 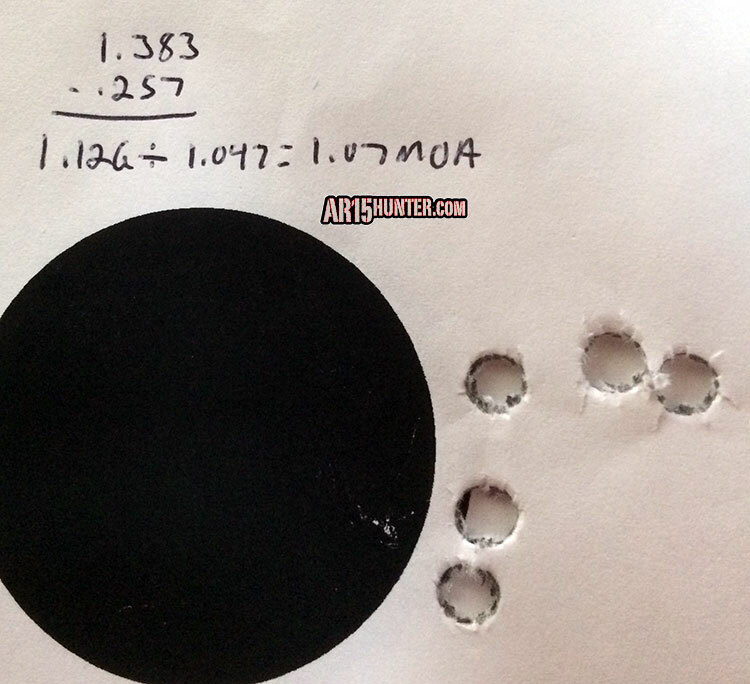 He shot two groups, which averaged slightly over 1.25″ at 100 yards, which was better than expected out of an unfamiliar upper and scope. His hunt report is included below. I received the ammunition and scoped upper from the Sharps Rifle Company right before I was scheduled to leave on my trip to Texas, where I would be hunting hogs, javelina and predators. Although I was familiar with the .25-45 Sharps cartridge, I wanted to see how it would do on some South Texas hogs, in a real world setting. Everything was going smoothly with my trip and I even arrived early to the ranch, so I was able to sit an evening stand and wait on some hogs. Nothing showed, but a large jack rabbit, so I would have to try again the next day. After a unsuccessful turkey hunt in the morning, I decided to switch over to predator calling that afternoon, then set-up for hog later that night. That afternoon, I headed out for some predator calling. 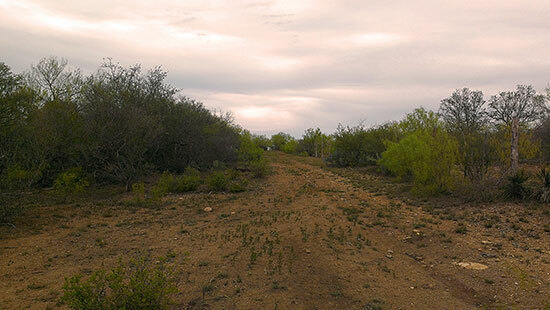 The area I planned on calling was at the intersection of three dirt roads, with thick brush and a barbed-wire fence line on the west side of the main road. I set my Foxpro up about 30 yards from the fence line, 75 yards down the road. I figured that whatever came in from the thick brush would be held up by the fence line, allowing me a shot. A few minutes into the call, a large coyote popped out of the brush looking for the call. He was wary and did not want to leave the cover, but was also stymied by the fence. As he stared in the direction of the call, I found him in my scope and took the shot. 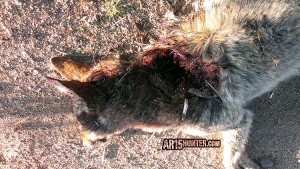 I heard the 87 grain Hot-Cor hit, and the coyote crashed back into the brush. I let the call go for a bit longer, but nothing else showed. I headed over to the area where I shot him and saw a large spray of blood and lung matter in the bushes behind where he was standing. The bullet hit him hard and the crashing I heard was him dropping in the brush about 20 yards from where I was standing. Because I did not have an easy way over the fence (thanks to my snake boots), I decided to leave him and collect him later, so I could head up the road to do some more calling before dark. However, that proved to be both a good idea and a bad idea. It was a good idea, because I was able to take a nice gray fox with another rifle, bad idea because the weather hit hard just as the sun went down and it was impossible to retrieve the coyote! The next morning, the weather in the area I was hunting continued to be harsh, with thunderstorms and steady downpours turning the ranch roads into soup. As most folks who hunt ranches know, the last thing a landowner wants is for you to be driving around in the mud, creating ruts on their roads. After a long discussion with my hunting buddy and the lease holders, we decided to call the trip a wash and head home. 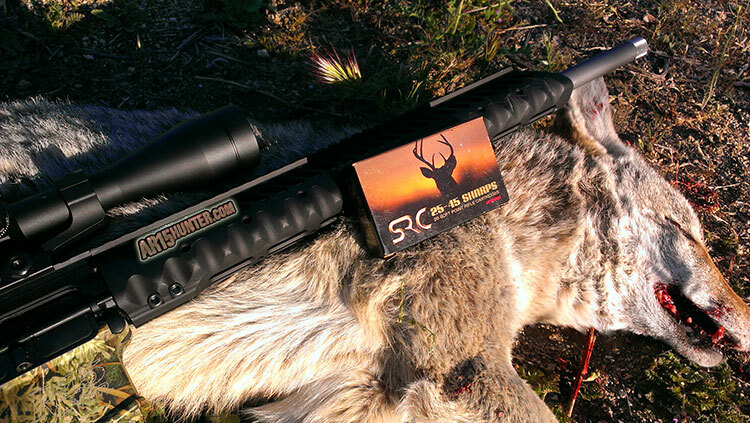 It wasn’t a waste of time, as I got to see the .25-45 Sharps perform on a coyote. But I always like to back-up my information with photos and video. This was not going to be the case in Texas, so I would have to try again in California. After a couple of stops on the way home, I finally reached California about 10 days after I left. The deadline for me to return the Sharps upper was fast approaching and I didn’t have any animals on video getting shot with the .25-45 Sharps. It never fails that when things look like they will not get any better, the phone rings and a landowner is on the other line asking you to take care of a varmint problem. This time it was a farm manager who told me that coyotes were killing the farm cats right on the front porch of the house and harassing their domestic geese. Since this particular farm was in an area I could hunt with the Sharps, I headed up the next day. The next morning, I arrived at the farm just after daylight. Since this farm was over-grown in many areas, I decided to drive through the farm before using my predator call. I did this to see if I could intercept any coyotes heading back to their bedding areas. As I pulled around a corner, we spotted a lone coyote walking through the trees, focused on something it was stalking. We continued on and parked about 60 yards past where we saw the coyote. As I loaded up the .25-45, my cameraman set-up the video camera, to try and record the shot. We still-hunted back to the area we saw the coyote and found it working its way down one of the rows. 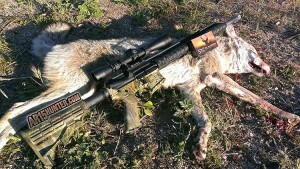 I placed the rifle on my shooting stick and found the coyote in the scope. After checking to see if my cameraman had the coyote on camera, I concentrated on the shot. I knew that even with the 50 yard zero, it would still be about 1.5 inches high where the coyote was standing 80 yards away. As mentioned before, this area of the farm was over-grown, so there was grass in my immediate line-of-fire. To remedy that, I held a little higher then I normally would, gave some whines with my mouth to turn the coyote, and pulled the trigger. The 87 grain bullet hit with a loud “whomp” and the coyote dropped immediately. It was dead before it hit the ground. The coyote weighed out just a bit over 20 pounds. It was a dry female, that was just hanging out alone on the farm wreaking havoc on the animals. The bullet damage was quite severe, with a very large exit wound. However, the bullet penetrated well and expanded enough to cause major disruption of the coyote’s upper internals. I have no doubt that performance on a deer or hog would be less dramatic on the outside, but just as effective on the internals, even at longer distances. Exit Wound from the 87 grain Hot-Cor bullet. Both Will and I were happy with the performance of the .25-45 Sharps cartridge, both at the range and the limited time I used it out in the field. The new AR15 compatible cartridge market is getting a little crowded, with these offerings coming at a time when the popularity of the AR15 platform being used by hunters is at an all-time high. However, whenever a company takes a wildcat cartridge, modernizes it and takes it mainstream, there will always be people who will benefit. Sharps Rifle Company has begun selling everything you need to get started with the .25-45 Sharps on their website. From the 87 grain Hot-Cor ammo, to AR15 barrels and even RCBS reloading and resizing dies, you can buy everything you need on their site. Will is planning a deer hunt to West Virginia in late November, into early December and we are hoping to have him outfitted with a .25-45 Sharps barrel and some rounds for the hunt. With the prices of AR15 rifles and parts coming down to levels we haven’t seen in years, the option to build a new rifle in .25-45 Sharps is something we are strongly considering for his trip. We hope to add to this .25-45 Sharps cartridge review with range and hunt report after the WV deer hunt, including a new article showing performance on larger game, so stay tuned!